"I am an Australia descendent of John Tevelein and Prudence Garth. I thought I might share the following with you in the hope that it might make its way onto your website and set the record straight for Prudence: a woman who had a most incredible life." "Believing what I have found to be true, I can only say that Prudence had a most amazing life, and perhaps it is even more exciting than that of a convict: I am certainly proud to be descended from this woman who seems to have survived being born out of wedlock, abandoned, emigrated, shipwrecked, lived with a bigamist who was in other ways a fine and upstanding member of society and bore him twelve children, eventually married to him and who now is remembered in a memorial in Launceston! Not a bad effort!" Birth: Thus from Prudence’s Death records we can calculate that her approximate birth year would be circa 1818 or 1817 (the death record saying she was 72 but the headstone 73). 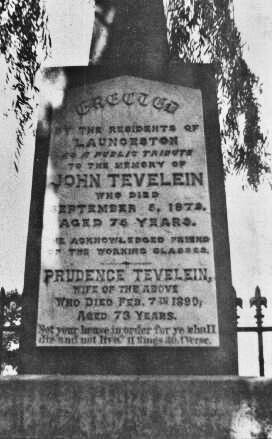 Burial: Australia Cemetery Index, 1808-2007 Record for Prudence Tevelein. 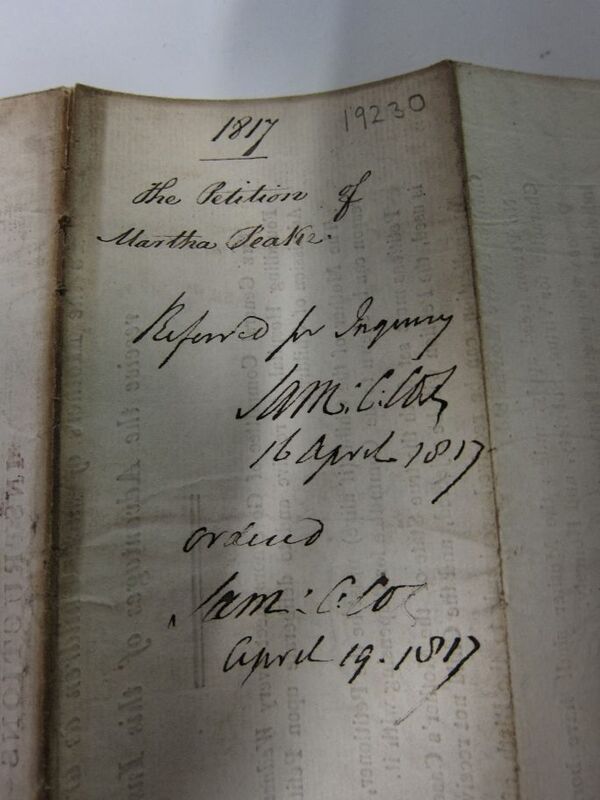 Dated: 07 Feb., 1890 Aged 73 years. Spouse John Tevelein. From photo of headstone provided by descendant. 2 recorded. Cemetery now defunct, Launceston, Cypress St Anglican Cemetary, LN03/00017. Death : Australian Death Index, 1787 – 1985. Name: Prudence Tevelein, Death Date 7th February, 1890. AGE 72, Launceston Tasmania, Registration Number 59. It is noteworthy that some family historians claim that Prudence was either a convict or the child of a first fleet convict, however if a committed researcher investigates the dates associated with these claims they will find that they simply do not match up with any of the substantiated records for Prudence; in particular her death records and consequently her age, making it plainly clear that Prudence was not a convict, nor a ‘first fleeter’ as has been claimed on numerous genealogy sites. 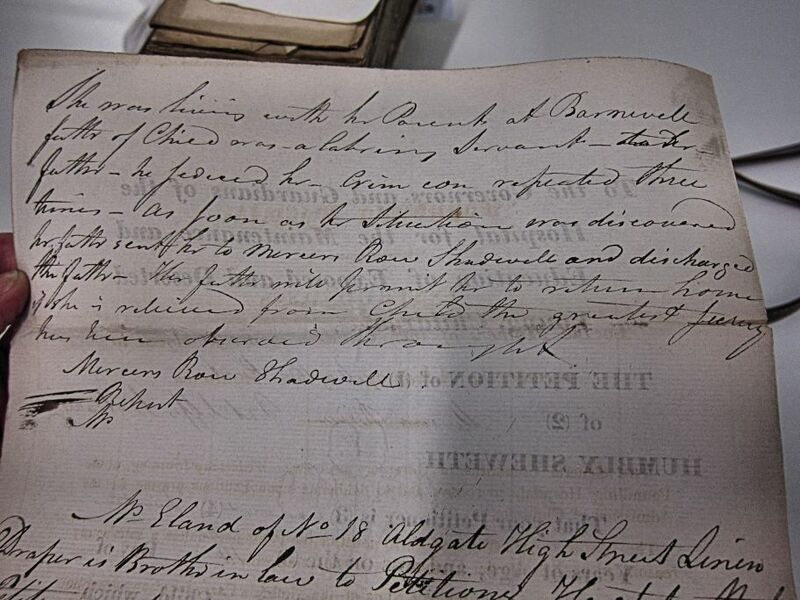 Thus I came to be looking for a Prudence Garth, born about 1817/18 and brought up in the Foundling Hospital in London. As it turns out I was going to London so decided to try to find Prudence, who is my 3rd great grandmother. 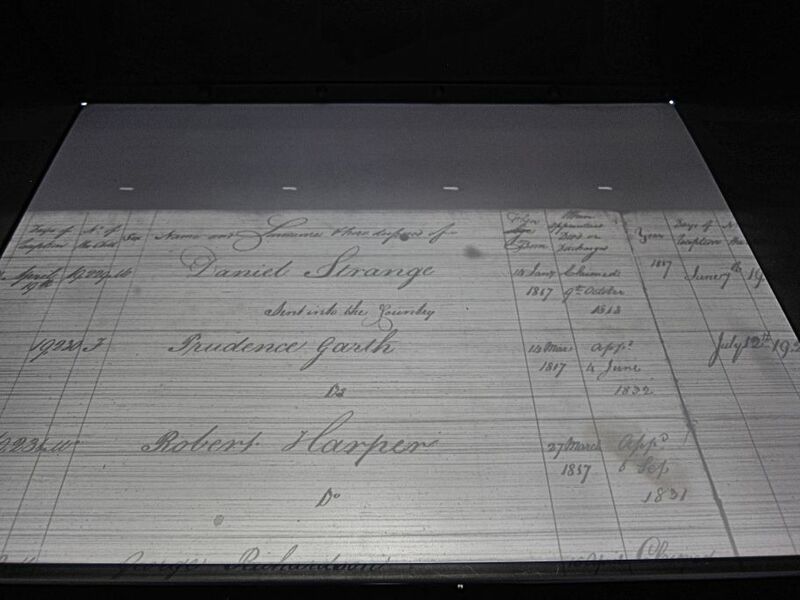 As people may or may not be aware, when children were accepted into the Foundling Hospital they were given a new name, not that of their parent/s. 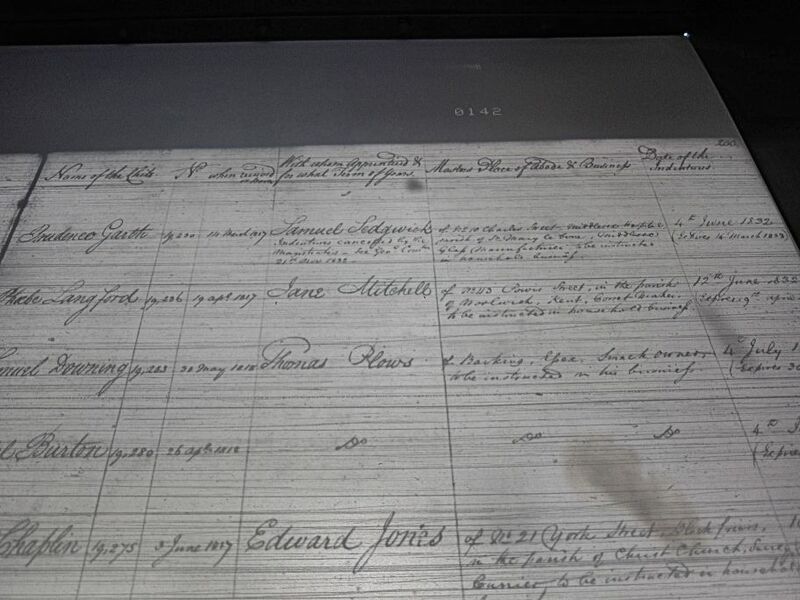 Thus the way to find them is not to search by the date they were accepted into the hospital or their supposed name or birth date, but by the records kept when they were apprenticed out (which was done under their new name) at around the age of 14. To the governor’s and Guardians of the hospital for the maintenance and education of exposed and deserted young children. 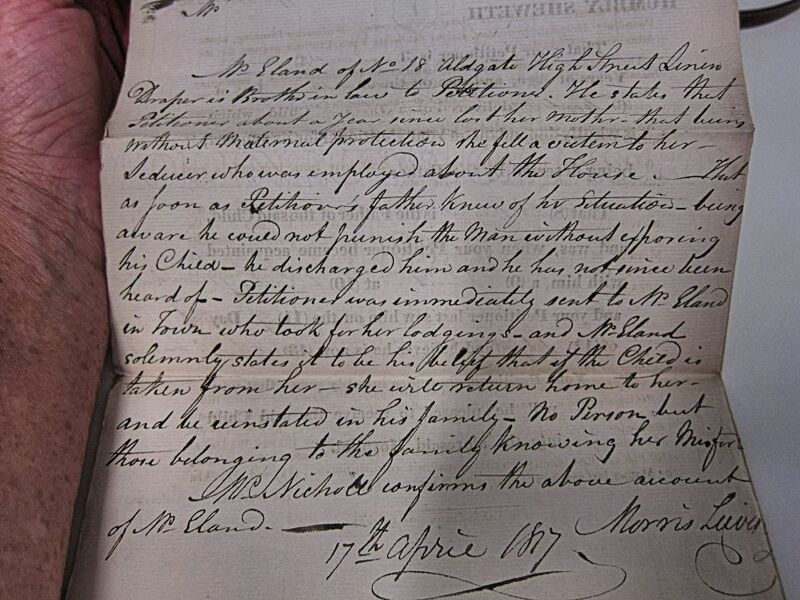 The petition of (1) Martha Peake of (2) Mercer’s Row, Ratcliffe Highway humbly sheweth that your petitioner is (3) unmarried (4) seventeen years of age, and was on the (5) 14th day of (6) March 1817 delivered of a (7) female child, which is wholly dependent on your petitioner for its support, being deserted by the father. 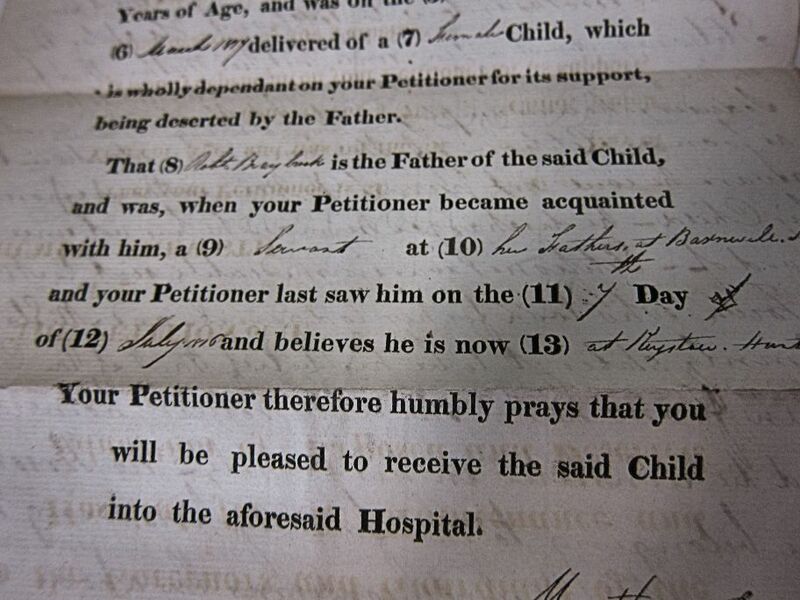 That (8) Robert Braybrook is the father of said child, and was, when your petitioner became acquainted with him, a (9) servant at (10) her father’s, at Barnswell North and your petitioner last saw him on the (11) 7th day of (12) July 1816 and believes he is now (13) at Keyston Huntingdonshire. Your petitioner therefore humbly prays that you will be pleased to receive the said child into the aforesaid hospital. Mr Eland of No. 18 Aldgate High Street, Linen Draper is brother-in-law to petitioner. He states that petitioner about a year since lost her mother. That being without maternal protection she fell a victim to her seducer who was employed about the house. That as soon as petitioner’s father knew of her situation – being aware that he could not punish the man without exposing his child – he discharged him and he has not since been heard of. Petitioner was immediately sent to Mr Eland in town, who took for her lodgings, and Mr Eland solemnly states it to be his belief that if the child is taken form her she will return home to him and be reinstated in his family, no person but the family knowing of her misfortune. Mr Nicholl confirms the above account of Mr Eland. 17th April, 1917, Morris ?Lumley? Therefore I am confident that this puts to rest any question about the birth details of Prudence Garth/Tevelein. Prudence’s mother was Martha Peake, and her father was Robert Braybook (anyone interested can find further detail of the Peake family easily enough, at the moment I am writing about Prudence so will not digress). Prudence’s date of birth was 14th March, 1817. She was accepted into the Foundling Hospital on April 19, 1817. At age 15 on 4th June, 1832 she was apprenticed to a Samuel Sedgwick of 10 Charles St Middlesex to be ‘instructed in household…? ?’; presumably to be a servant. The indenture was to expire on 18th March, 1838, however a note on the apprenticeship records shows that Prudence’s indenture was cancelled ‘by the magistrates sec gen committee’ 21st November 1832. I did not have time to search for any minutes of that committee meeting, however it seems likely that Prudence’s apprenticeship indenture to Mr Sedgwick lasted for only five months, and I don’t know why, or what happened next.